Al Qaeda-aligned militants operating in Syria could already have access to "biological pathogens or weaponized agents," according to terrorism and biological warfare experts studying the region. 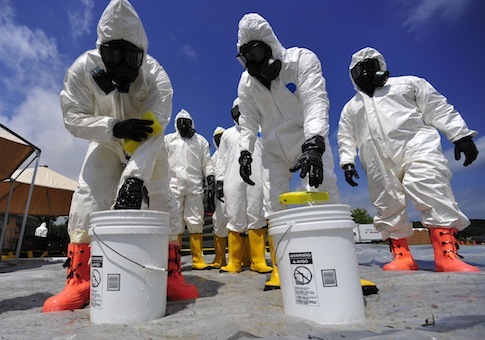 The possible acquisition by al Qaeda of these highly dangerous toxins has prompted bio-warfare experts to label the threat a "clear and present danger." "The Syrian civil war has left sections of the bio-pharmaceutical infrastructure destroyed and looting of labs has been observed, which could indicate that Assad is losing command and control over one of the most dangerous classes of weapons remaining in his weapons of mass destruction (WMD) arsenal," bio warfare and terrorism experts Jill Bellamy van Aalst and Olivier Guitta conclude in a new report. "A very credible source has confirmed he saw, near Aleppo, a looted pharmaceutical laboratory, which was probably a cover for a biological weapons production site," Guitta and van Aalst revealed in a research brief published by the Henry Jackson Society. "Syria's biological warfare programs are latent, highly compartmentalized, and dual use, run under both legitimate and clandestine programs, laboratories, institutes, and facilities," the report states. "The fact that this looting took place in the Aleppo area where the rebellion—and in particular Al Nusrah—is very strong tends to confirm that AQ may potentially be in possession of biological agents." Al Qaeda’s primary biological weapon expert, Yazid Sufaat, was arrested in Malaysia. "His arrest is all the more concerning given that the [United Nations] has allowed the Assad regime to maintain its [bioweapons] program," according to the report. "In 1993, Sufaat established Green Laboratory Medicine, a pathology lab where he tried to weaponize anthrax on behalf of al Qaeda," according to the report. "Sufaat had direct ties to Nawaf Alhazmi and Khalid Almihdhar, both of whom were on Flight AA 77, which crashed into the Pentagon on 9/11." "The structure of Syria's biological warfare programs are latent, compartmentalized, and spread across its remaining bio-pharmaceutical infrastructure," the experts write. "The programs are designed to be highly agile to allow swift production if required." "It is a religious duty to have them; how we will use them? It is our business," he was quoted as saying in 1998. The Pentagon later revealed in 2004 that al Qaeda has a relatively sophisticated bioweapons research effort underway, the report notes. "The problem with bio-weapons, unlike chemical or nuclear, is the quality and weaponization for dispersal that counts, not the quantity, Guitta and van Aarst wrote. "You do not need a stockpile and you do not need sophisticated delivery methods, in fact, that is no longer optimal. Bio-weapons are silent, and determining that an attack has occurred can be challenging." UPDATE: A previous version of this article quoted a report from the Henry Jackson Society that said Sufaat was arrested in February 2013 while trying to enter Syria. The report's claim was inaccurate and has been updated. This entry was posted in National Security and tagged Al Qaeda, Bashar al-Assad, Syria. Bookmark the permalink.